When I run this script I am getting 'Did not solve after 999 episodes'. I have tried using TensorFlow 1.3 and 1.4.1 using Python 3.6.3. Any suggestions why I am not getting the results you are seeing? When I ran it locally it took around 1000 episodes to solve. tensorflow-gpu==1.4.1, python 3.6.0. I ran this locally as well, and it has never succeeded in under 1000 episodes. The code is solid, and the method looks great. Overall, it's a great project. I just don't think that this should be #1 on the leaderboard of best CartPole-v0 performances. @gstenger98 but nevertheless it was able to solve it in 85 episodes according to https://github.com/openai/gym/wiki/Leaderboard#cartpole-v0. And I believe that the matter is in versions of libraries you use while trying to reproduce the results. 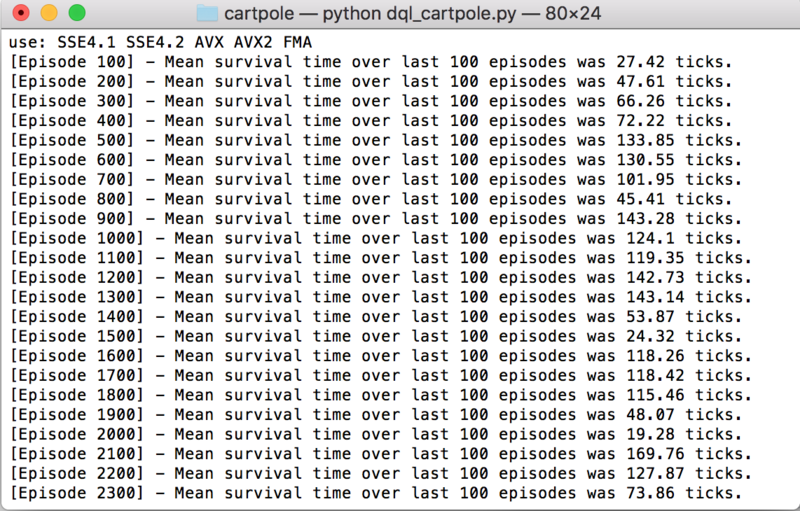 @gstenger98 also I noticed that it's a bit unstable, sometimes NN can find the right weights in < 500 episodes, and sometimes it can learn just nothing in >= 1000 episodes - I had the case when there wasn't any reward greater than 25 through all 1000 episodes. Perhaps it's unstable because it is not using target networks? I ran this programme got did not solve after 999 episodes.